When you hear the word witch, what comes to mind? I hear a cackling laugh. I see an ugly, hunchbacked woman dressed in black. She is stirring her cauldron of potions, flying on a broom in the moonlight, and casting up-to-no-good spells. This is probably the image most people have. Witches were hunted and killed throughout Europe from 1450 to 1800 CE. When Christianity spread across Europe, churches demonized any other religious or spiritual practice. Paganism was the dominant indigenous practice at the time; herbalists and healers were categorized as Pagans. If anything bad happened, such as farmers losing their crop or someone falling ill, the church blamed the witches. Using fear as a main weapon, the churches tore towns apart by encouraging people to bring witches to trial. It was impossible for a person to survive the trials once accused. “Testing” meant torturing, stoning, burning, or drowning women. If you somehow survived, then you were a witch—and were killed anyways. More than 200,000 women were accused, put on trial, tortured, and died. European indigenous spirituality gave people a sense of connection to the land, the seasons, and the cycles. Massive witch hunts destroyed that connection. Nowadays, we brush our dark history under the rug. I personally didn’t learn about any of this until my adult years. The culture that the witches came from, however, is returning. 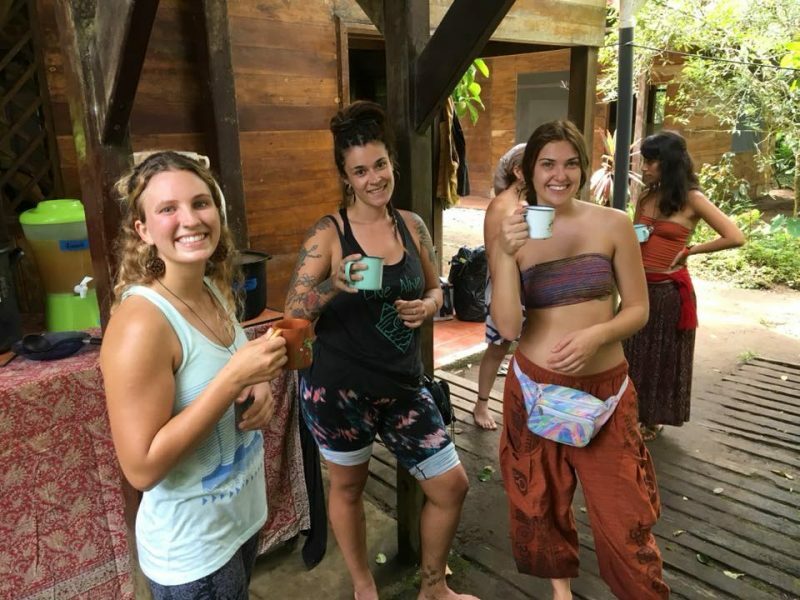 People around the world are following an innate desire to connect with the earth through herbalism, natural healing practices, and permaculture. In October, I attended Medicines from the Edge, a medicinal botanical conference hosted at Punta Mona. Located off the tropical Caribbean coast, where the jungle meets the sandy beach, Punta Mona was the perfect site to celebrate this relationship with the earth. 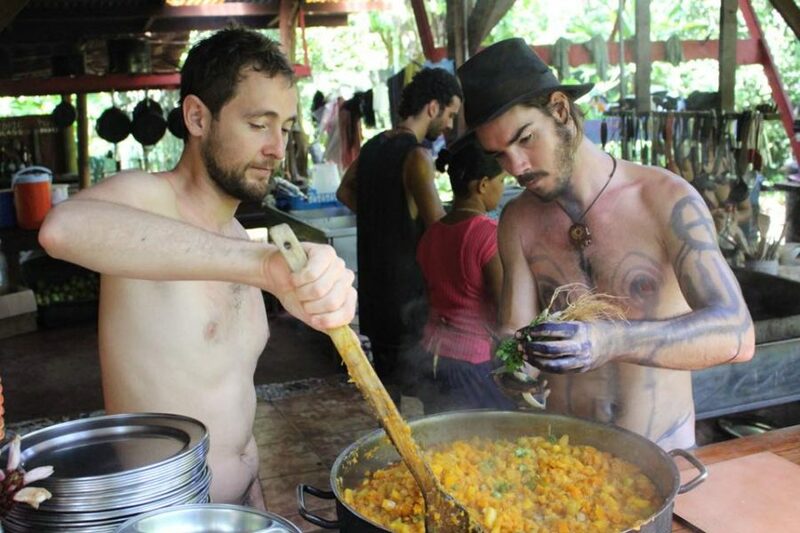 Blooming lotus flowers, crawling gotu kola, mints and sages, climbing vanilla and black pepper, bushy maté and blackberry jam fruit and, jackfruit, soursop, and durian dripping from the trees—Punta Mona is a 17-year-old mature permaculture food forest. A variety of teachers covered workshops on natural medicine making, propagating plants, working with rural and refugee communities, supporting digestion and immune system, and touring the plants in the field. Of course, cackling laughter abounded, music rang out around the fire, and delicious medicinal teas were concocted and consumed. 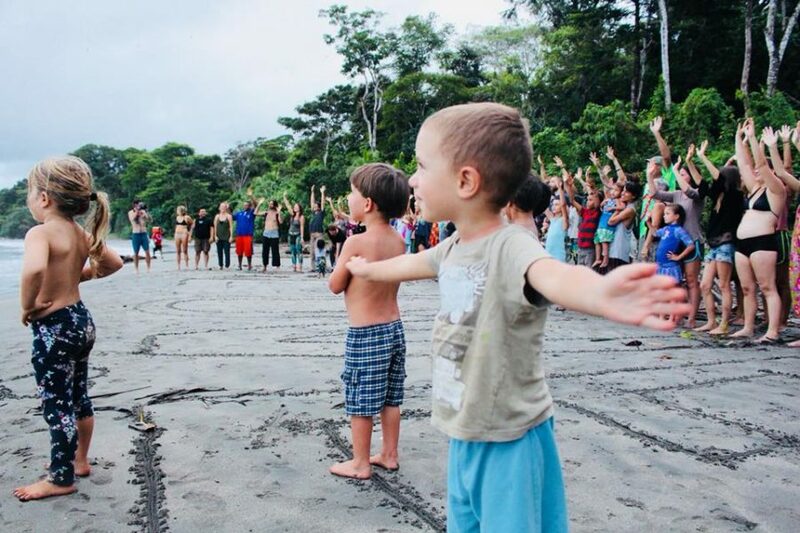 Beyond the workshops—and the conversations, communal meals, wild children, and family vibes—Medicines From the Edge was a profound experience for me. 1) Anyone can be an herbalist. Anyone who uses plants as medicine is an herbalist. Do you use spices to cook? Do you drink tea? Then you are a practicing herbalist! Of course, there is a lifetime of depth and knowledge in the field of herbalism; however, anyone can apply basic knowledge right away. Knowing this allowed me to not judge myself on how little I currently know. In addition to the workshops, I learned just as much—if not more!—about herbalism by exchanging personal experiences with all the attendees. Everyone was enthusiastic about plants and keen to share how they grow, process, and consume herbs. One large focus area of the event was the children’s area. Over 30 children attended. They participated in plant walks, made botanical illustrations, formed chocolate truffles, and played in nature. I was impressed when one little girl identified a variety of plants on a plant walk. Young or old, it’s experience that counts—and these youngsters were definitely on the herbalist path. Farm tour with Stephen Brooks at Medicines from the Edge. Most close friendships take time to develop. The same is true of building a relationship with a plant. Sarah Wu and Stephen Brooks, the co-founders of Punta Mona, like to joke about how, when they are walking together, Stephen is looking up at the trees, while Sarah is looking down at the weeds. They are drawn to different plants, have worked with them for many years, and know them in different ways. Just like relationships with people, we have different types of relationships with plants. Some are close friends and allies… and some, don’t touch or else! 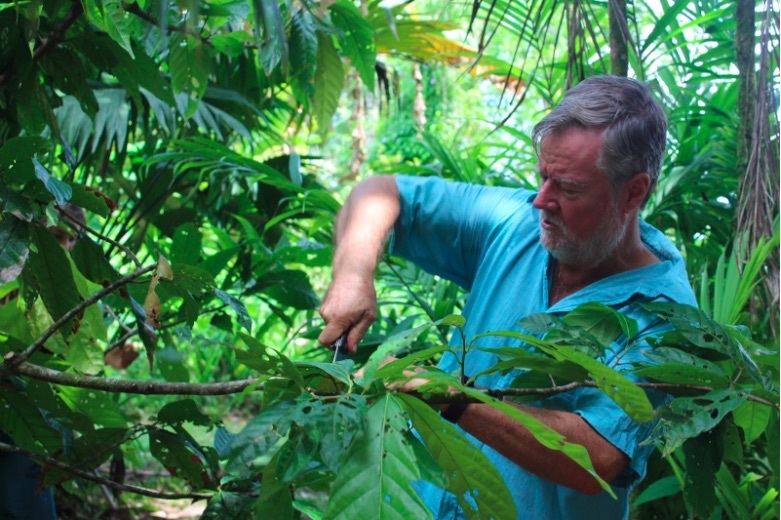 It was a special treat having Ancel Mitchell from Finca la Isla lead plant meditation every morning. 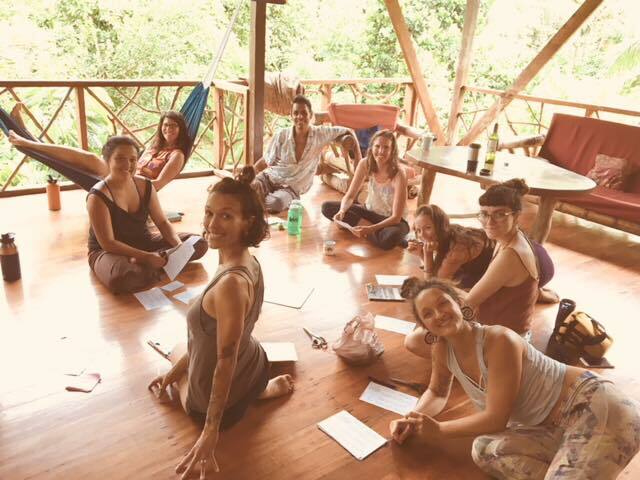 During Ancel’s plant meditation class, she explained how time is relative. Plants have been on Earth for millions years more than we humans. What’s more, plants move through time much more slowly than we do; therefore, slowing down, observing, and interacting with a plant will teach us more than we might expect. Meditating in nature calms the body, reduces stress, and activates the senses. 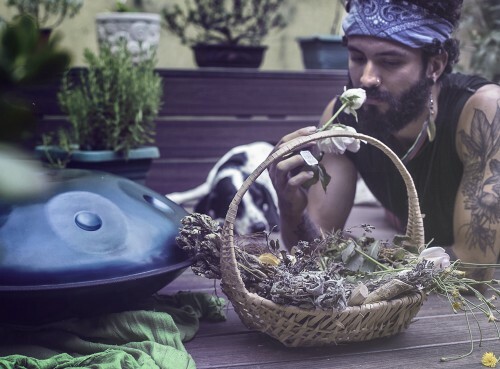 By meditating with the same plant over time, we can notice subtle changes in plant growth, insect or animal interaction, and a plant’s response to the elements around it. Why do patterns appear in nature? Patterns are filled with information, and an herbalist looks for them in texture, taste, smell, and physical features to determine how and when a plant can be consumed. Rachel Thomas, founder of Hidden Garden, led a workshop called Traditional Digestive Therapies. Not only does Rachel find patterns in plants, but she also identifies patterns in how indigenous people around the world work with medicinal plants and healing practices. For example, people living in traditional ways across the globe will analyze qualities of the blood and qualities of specific plants that affect the blood. Bitter greens cleanse the blood and body. Soft bitter plants like nettles, chamomile, and red clover will cleanse the liver and blood; eating a small portion of these soft bitters daily is safe. On the other hand, hard bitters plants like jackass bitters are prescribed only for a short amount of time, because they are intense for the body. They will cleanse parasites and reset the blood. Most of the time, there are simple and rational ways to remember this useful information. In this case, most people are repulsed by bitters—and so are parasites, biting insects, and elements in the blood that do not maximize health. Likewise, mucilaginous herbs have a slimy texture. They are important for maintaining the mucus membrane of the digestive tract and breathing tubes. Chaya, chia, aloe, flax seed, okra, chan, and spinach all contain polysaccharides that produce the mucilaginous texture, and we can safely consume these plants daily. I found it fascinating that there is a correlation between analogous plant and body characteristics and their healing qualities. 4) Wildcrafting does not equal foraging. Sara Wu sharing her favorite medicinal herbs at Medicines from the Edge. Imagine walking through a forest looking for an herb that is only found in the wild. You want to use it to make a valuable medicine… and you find it! How much and how do you harvest it? I learned that there is a big difference between foraging and wild harvesting (or “wildcrafting”) in herbalism. Harvest only after finding the third patch of the herb. Only harvest 30%—harvesting more may damage the plant. Help the plant thrive by spreading its seed, propagating it, peeing on it, giving the plant mulch, or fluffing up the soil. As mentioned earlier, herbalism is about developing a relationship with plants. Thus, the plant gives to us, and we have the opportunity to help the plant in exchange. Harvest the plant depending on other influential factors such as environment or market. For example, if a flood, fire, or pest came through a wild area recently, then be extra aware of the health and density of the plant in that area. Or, if the market prices have encouraged over-harvesting of a plant to the point endangerment, then spread awareness and protect the areas where the plant grows. Peter Kring demonstrating air layering, a plant propagation technique during Medicines from the Edge. 5) Build your apothecary by stacking functions. Lavender, for example, has antiseptic, antibacterial, and antifungal properties. The name “lavender” derives from the Latin lavare, which means to wash. Lavender can treat restlessness, insomnia, nervousness, and depression. Additionally many herbalists use it to soothe a variety of digestive complaints including loss of appetite, vomiting, nausea, intestinal gas, and upset stomach. Some people use lavender for pain, too, including headaches, toothaches, sprains, nerve pain, insect bites, and joint pain. It can aid in healing acne and hair loss. It is used in many natural insect repellents. It can also be added to bathwater to treat circulation disorders, improve mental wellness, and aid relaxation through its pleasant aromatherapy qualities. In addition to understanding the healing properties and uses of an herb, it is advisable to include bountiful, accessible, and easy-to-make medicines in your apothecary. 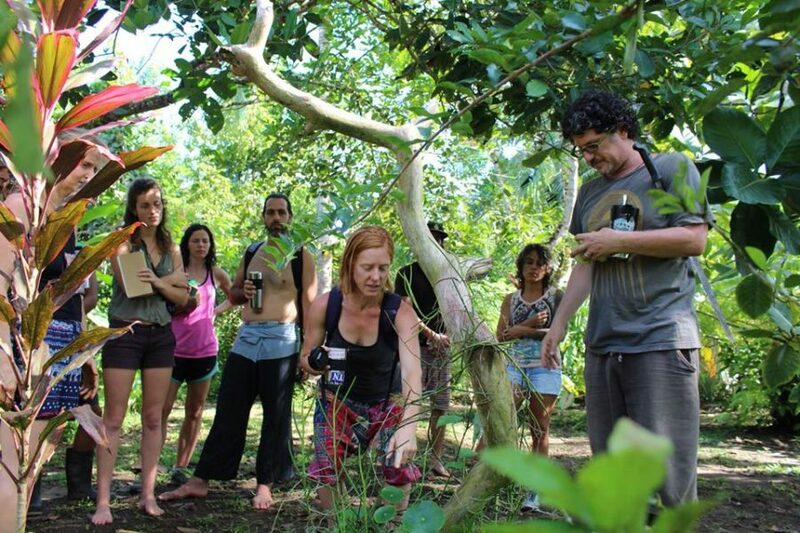 Latina herbalist and tropical biologist Maria Jose led a medicine-making workshop. Choose a medium-priced red, white, or cherry wine—or make your own. Cheap wines tend to have sulfur, which can ruin an infusion. Add up to 30 grams of medicinal plants, such as oregano, cinnamon, peppermint, or lavender. Then, cork the bottle and tape it to block any air from entering the container. Let it sit for 7 to 20 days in a cool place where the temperature doesn’t vary, away from direct sunlight. Maria puts her bottles in the ground. After one to two weeks, the medicinally-infused wine is ready to enjoy in small quantities. This recipe has been passed on from generation to generation with influences from the modern day. I appreciated learning from Maria’s cultural perspective and practices. I realized that medicinally-infused wines are easy to make, can serve many functions, and are delicious to consume. Filling an apothecary with a few powerful healing herbs that treat many different symptoms, illnesses, and injuries is a great service to offer your community. 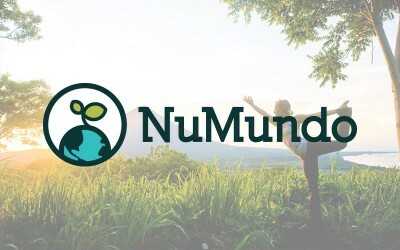 This service isn’t just essential for health and well-being; practicing plant medicine connects us with the earth, too. I am grateful to have participated in Medicines From the Edge. 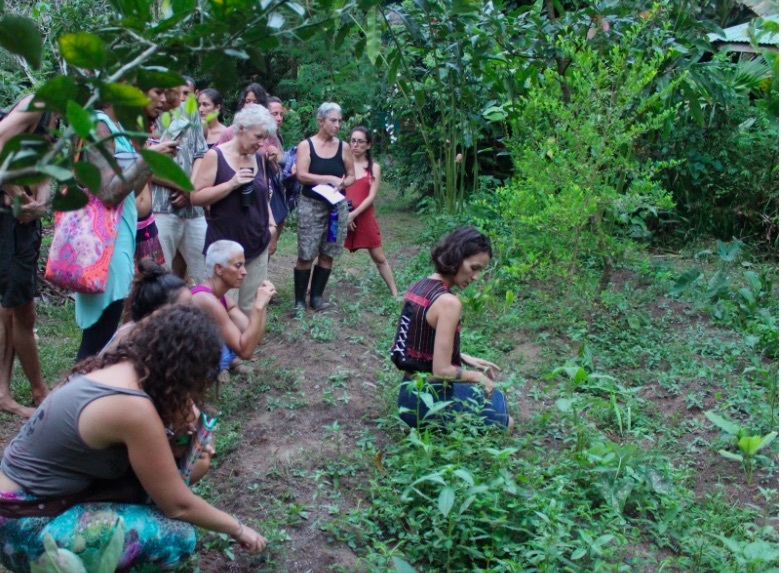 This intimate family gathering brought together, excited, and empowered modern-day witches from around the world. Learn more about Medicines from the Edge at their Facebook page. Book your own witchy stay at Punta Mona here.